We invite you to explore India - the Land with infinite beauty ! Whether you soar high into Himalayas or peer under the ruins of the Ancient monuments dotting the landscape of India, you will cherish the experience long after your visit ! This India Travel Guide on Divine Retreat Center Chalakudy is free from any commercial interest! This site is dedicated to promote India - the vast subcontinent, its glorious past, magnificent landscape and its infinite variety. Located amidst the picturesque landscape of Muringoor in Chalakudy, Kerala is the world's largest Catholic retreat center. Divine Retreat Center, a part of the Roman Catholic Charismatic Renewal, originally started in 'Potta', a tiny village about 45 km from Cochin - a Kerala coastal town - with 4 Basilicas around it. Started by Fr. 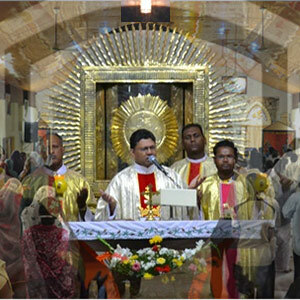 Mathew Naickomparampil, a priest from the Vincentian Congregation in 1977, the center has grown to attract millions over the years. Other Vincentian priests like Fr. George Panackal VC and Fr. Augustine Vallooran VC ably minister in the DRC. Not restricted to Catholic Christians alone, the Divine Center is open to non-Christians as well as other Christians. The participants from diverse background have a sole purpose - that of connecting and strengthening individual relationship with God. It is indeed a twin treat, visual treat and spiritual getaway that beckon millions of people every year to the Divine Retreat Center, now in Muringoor, Chalakudy. The word 'retreat' in its etymological meaning signifies a withdrawal. And, the Catholic Encyclopedia strongly recommends spiritual retreats. It is meant to take a break from the routine of life and sincerely seek spiritual guidance. The Divine Retreat format is aimed at spiritual, psychological, physical and emotional well-being of the participants. Everyday and every element of the retreat make this attainable. The retreat begins with an introduction. The retreat experience offers a time for reflection and peace as it opens avenues for enhancing spirituality and also ushers in positive and everlasting effects in life. Driven by an intense desire to connect with God, one should take off time, head to the retreat center, soak in the silence, feel the spiritual atmosphere and allow the soul to experience closeness to God. As the retreat draws to a close, the week-long spiritual experience prepares the participant to return to responsibilities of life with a fresh perspective, greater discernment and revitalized energy. Three important factors contribute and influence a true spiritual endeavor. Specific time set aside to fully involve with no interruptions. A safe, quiet place to pray, introspect or reflect within. The Divine retreat center in Muringoor Chalakudy supports thereby deepening the desire for developing life of prayer and relationship with God. Muringoor Chalakudy retreat center satisfies those looking for a place where peace and tranquility fill the air, a kind of environment and atmosphere that energizes and inspires to connect with Almighty through the Holy Spirit. There are two campuses in Potta Ashram, one for retreat in English and the other in Malayalam. Retreats in other languages like Konkani, Kannada, Tamil, Hindi and Telugu are also held simultaneously every week. The weekly English retreats start at 10.00 am every Sunday and ends on Friday at 2.00 p.m. Retreats for children and bible nursery for tiny tots are also held every week. Besides the weekly English retreat there are special retreats. The first quarter schedule is as follows. The retreat fee includes cost towards accommodation and meals provided to the participants during the period. Cost per child: Rs. 150/-. Besides comfortable and appropriate clothing required for a spiritual retreat, astute participants may like to carry a Bible, notebook, pen, torch, two bed spreads and a Rosary. Muringoor is a small village in Chalakudy Taluk in Trichur district in Kerala. It is right on the banks of the river named Chalakudy. Located along the National Highway 47, between Cochin and Thrissur, reaching Chalakudy isn't difficult. It is well connected by Air, Train and Bus services. By Train: Reach nearby railway stations like Koratti Angadi Railway Station, Divine Nagar Ha Railway Station, Chalakudi Railway Station, Karukkutty Railway Station. By Air: The nearest airport is Cochin International Airport. Distance from the airport is around 22 kms and just 30 minutes drive. By Road: National Highway 47 passes along the town that connects Cochin and Thrissur. Chalakudy has a KSRTC and private bus stand in the town only.